A pioneer brand of the 60s, the label featured decorative drapes forming a border, which we learnt reflected her career on the stage. The label was in effect a theatre but, there was nothing on the stage! We looked to the brand name for inspiration, and brought alive the ‘mouton’ with ram’s head resplendent and a beard of grapes….the new label made both a real connection with the Baroness and, provided an emotional hook that engaged consumers, it also was a gentle reminder that this was the accessible cousin to Chateau Mouton Rothschild. Art became performing art. Mouton Cadet was one of the first wine brands to showcase a ‘critter’ - the derogatory name given to wine and spirit labels sporting an animal. However, they are there for good reason. AC Nielsen reported in 2008 that nearly one in five table wines introduced in the previous three years featured an animal on the label and wines with animal images or brand names outsold those that didn’t, by a proportion of more than two to one. This trend may have been set by Yellow Tail – the biggest selling wine brand in America at the time. Thinking beyond Yellow Tail and looking deeper, animals have an enduring appeal – they are a crucial part of our culture – part of growing up and being told stories. Whether the big bad wolf in Red Riding Hood or the industrious ant in Aesop’s Fables. We are also prone to anthropomorphise animals: in turn we become as 'wise as an owl’ or, 'sick as a parrot’. We are ‘primed' with animal images from an early age and this is key to their successful use by brands. Building on psychological research about processing fluency, Labroo (University of Chicago) and Dhar ( Yale University) wrote a paper called ‘Of Frog Wines and Frowning Watches’. They found that consumers have an easier time processing images when they are already ‘primed’ i.e. they have already thought about the image earlier in an unrelated context or if they already associate the image with something in their personal lives. In one experiment, participants did a word jumble either searching for words related to dogs or words related to cats. They then participated in an ostensibly unrelated study and were asked to rate a series of products, including batteries and dog shampoo. Those who had done the word jumble relating to dogs, rated the dog shampoo higher, than those who had done the cat-related jumble. The influence was most pronounced when exposure to the product before evaluation was limited to 16 milliseconds, a period of time shown in psychological experiments to be pre-cognitive, i.e. below the threshold of awareness. The word gazelle comes from the Arabic word ‘gazal’ meaning elegant and quick. Appreciated for its grace, the gazelle is a symbol most commonly associated in Arabic literature with female beauty. 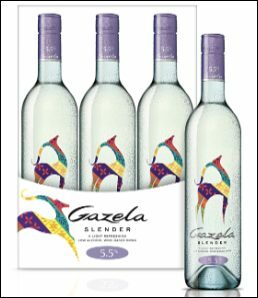 Sogrape Vinhos is launching Gazela Slender, a lighter, refreshing wine with a lower 5.5%ABV. Lewis Moberly’s design for the stylised, iconic gazelle on the label wins the eye and epitomises the beauty, grace and elegance that women aspire to, in a light hearted, contemporary and colourful way. Monkey Shoulder, is a name related to the shoulder strain once experienced by malt men turning barley with shovels – industry jargon unknown to most consumers. But by combining the brand name with three pewter monkeys representing the blend of three malts, which sit on the bottle shoulder, ‘primed' consumers are drawn towards the bottle and rewarded with the story about the origin of the name. The brand world created around Monkey Shoulder also plays to primed cues. The cocktails in which it appears are given names that we have already met in other circumstances, for example a 'Brass Monkey’. And at music festivals, through the construction of a special tree house bar, Monkey Shoulder is found inhabiting trees like its primate namesake. In St Moritz’s venerable Hotel Soldanella there is the ‘Zoo Bar’ so called for its serves of alcohol bearing animal names and images. Once intrepid Cresta run riders were welcomed into the bar with an “Elephant”, a drinking ritual whereby the guest, accompanied by loud feet stamping and cries of “The elephants are coming over the Alps!”, were expected to down Elephant beer through a drinking straw. Legend has it the Elephant beer supplies soon dried up and were replaced with a beer called Giraffe. Who knows what is fact and what is fiction? Either way, animals provide a rich source of engagement and brand inspiration when it comes to branding. The French-language "Methodical Encyclopaedia" of 1782 was apposite when it defined a menagerie as an "establishment of luxury and curiosity".